Make Up For Ever Ultra HD Concealer ($27) is a new dark circle corrector and concealer collection that promises instant radiance under eyes. This new concealer formula has a host of great sounding benefits like an Anti-Dark Circle Complex with Radiance Booster that wakes up tired eyes. As well as a formula that fills and smooths fine lines plus Pure Focus Pigments that reflect light to erase shadows and hylauronic spheres that prevents moisture loss. But like many concealer options out there Make Up For Ever promises a little too much and delivers too little. 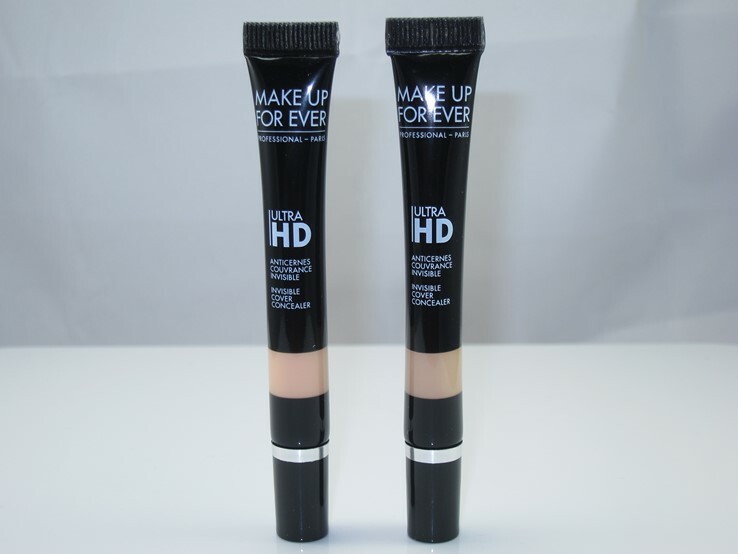 Make Up For Ever Ultra HD Concealer is a slightly confusing product. Unlike Bobbi Brown Intensive Skin Serum Concealer, Make Up For Ever does not separate their concealers from their correctors. For example, Intensive Skin Serum Concealer is one formula with a range of shades and Intensive Skin Serum Corrector is another formula with its own set of shades. Make Up For Ever is a single formula with a range of two different shade selections. The R shades are the color correcting shades where as the Y shades are the concealer shades. I think the average everyday user could potentially not realize that the collection includes shades for concealing and correcting. Of course, I’m taking into consideration that they don’t separate this in a display which I’m thinking they likely won’t. So, you head to the store and start swatching away and you might just purchase a corrector shade versus buying a concealer one or vice versa. It’s a little confusing They should have done a Make Up For Ever Ultra HD Concealer and a Make Up For Ever Ultra HD Corrector and labeled them as such. I just hope when they launch in store that the display makes it obvious which is which. I have puffiness, finer lines, and tired eyes but I wouldn’t say I have heavy duty dark circles. Personally I’m looking for a concealer that will make my eyes look awake, refreshed, and one that will conceal my puffiness and finer lines. In a formula, I’m looking for creamy, hydrating, and pigmented. I also look for something that blends well doesn’t cake and doesn’t crease. I’ve pretty much found my HG (holy grail) concealer at this point which is Em the Great Cover Up. However, I still like the thrill and the chase of discovering something potentially better. Make Up For Ever Ultra HD Concealer is unfortunately not it. Make Up For Ever Ultra HD Concealer packaging is slightly misleading as it appears a lot smaller than it actually holds. This is a thinner tube that holds 0.23 oz of product for $27. For what it does, this is quite expensive. However, I actually thought there was a lot less inside the tube. That isn’t to say that this isn’t a small amount for the price, it’s just that it felt so light I thought it held a lot less. If I use this daily, I see myself running through it very, very fast. This has an odd little rounded, slanted spout that the concealer flows out of but I don’t think they mean for you to use it directly on your eyes so I squirt a little on the back of my hand and use a brush for application. It flows very fast so be careful when squeezing the tube. I will say a little won’t go a long way though as this applies very sheer. I heard a lot of complaints about the limited shades in this collection as Make Up For Ever is legendary for creating a variety of colors to fit many different skin tones. I will say I was happy it was kinda a one size fits all type of shade range and was hopeful I’d fit into one of those five groupings. It can be difficult to purchase shades online so when they break it down to light, light medium, etc…it makes shopping concealer or foundation online a little easier. Weird mentality, I know, but that’s how I felt about the shade range. Anyway, the “one shade fits most” shades didn’t turn out great. I ended up purchasing three concealers and three corrector shades. The first batch I ordered online in Light to Medium and Medium as I was undecided which would be best for me. Unfortunately, that batch went back immediately. These shades obviously run very, very, very, very, very light. The Light to Medium should have been a good fit for me but this was a pale ivory that would be best suited for someone with super cool, super fair skin. I finally settled on Medium to Tan and that was a good light beige shade that fit my tone perfectly. But just keep in mind these run very light. This formula is super thin, creamy, and lightly hydrating. It applies fairly easily, absorbs fast, and blends nicely under my drier eyes. Not everyone is going to like this texture but I did and I thought it was easy to work with. The concealer was quite sheer but it brightened my eyes up nicely. It didn’t do well concealing my puffiness unfortunately and it did crease into my finer lines within a three hour period and wore for about six hours before fading completely leaving behind a bit of concealer caked into my finer lines. Now the corrector does diffuse the appearance of some issues and when used with the concealer you’ll get more coverage. However, I think it deserves to be mentioned that concealer should be pigmented enough to conceal dark circles, puffiness, and finer lines. You should not have to spend $54 on two separate shades of corrector and concealer to do two jobs. I happen to be of the mentality that unless you have SUPER dark circles you likely won’t need a corrector shade as your concealer should be pigmented enough to conceal most problems. I don’t personally use a corrector because I don’t like layering several products under my eyes. They are dry, they are finely lined, and they are puffy and I find layering tons of stuff under them makes them look worst. I desire something lightweight with good coverage that’s hydrating. 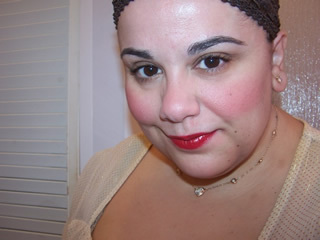 I do not want to have to apply a corrector shade and layer a concealer on top. For me, personally, it’s too much product. In Make Up For Ever’s defense I will say their formula is very thin and lightweight. This in fact makes it very easy to layer with so it never looks caked on or heavy nor does it look unnatural. However, the fact you have to go an extra mile and spend extra money to achieve the desired result kinda stinks. On top of that the corrector shade is equally sheer so yes it offers a little bit of extra coverage and brightens up the area a little more as well as diffuses some darkness but even after adding the concealer on top this is not something that will completely eliminate more difficult to conceal problems. I think the formula is a little over marketed as I mentioned above. If you don’t need a ton of coverage I think Make Up For Ever Ultra HD Concealer is a potentially good pick up. It isn’t however, a perfect pick for those seeking a work horse concealer that will conceal darkness, puffiness, etc….I think this one is more about diffusing the look of problems versus actually concealing them. Funny thing is I really like the lighter, weightless feel and I’d likely repurchase the concealer shade but the fact that it creases and doesn’t wear super long makes it a no go for me. Make Up For Ever Ultra HD Concealer is good for those of us who have very, very little to conceal (lucky you!). Make Up For Ever Ultra HD Concealer is available now at Sephora and Sephora.com. I’m so glad I’m not the only one that disliked these. 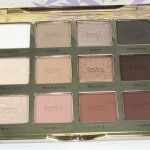 The shades are way off and very light as you noted.. And not enough coverage either. And I also do not want to have to purchase two for correcting and concealing. I was so excited to try this as soon as they were available but was super disappointecd. I really enjoy MUFE Lift Concealer. I can’t say that it “lifts”. However it is lightweight and it does not end up in the fine lines. Many concealers make this claim, but Lift Concealer actually delivers. It’s one of the products I continue to repurchase, and I’ve spent a fortune trying high end concealers. Thanks so much for this honest and in-depth review. You just saved me from buying these and having to go through the hassel of returning them. I need a heavy duty coverage concealer so these aren’t going to work for me. I was tempted to buy them because of all of the rave reviews on YouTube, but now that I think about it, it seems like most of the YouTubers I’ve seen reviewing these are young 20-somethings without much to conceal. What undereye concealer would you recommend for those of us that need more coverage? Something thats also brightening would also be a big plus. Thank you. Hey I forgot to mention that Michelle Phan announced in one of her latest videos that she’s completely re-doing her entire makeup line and coming out with all new products. Hopefully she will stick with The Great Cover Up concealer formula but maybe just repackage it? Fingers Crossed. oh gosh I hope it doesn’t get diced. I might have to go stock up before anything changes JUST in case! Very nice review but what about the ingredients ? Can you add a pic of its full ingredient list please ? Oh no! This is on the way to me as I seen so many rave reviews online, but my dark circles are awful 🙁 I just bought the correcter though so may give it a go and see how it fairs but like you I hate layering! Let me how you do Stephanie! Curious minds if you like! Tried it and its far too sheer, I end up having to layer it with another concealer which for me defeats the purpose. But saying that if my dark circles were not that bad I would love this, gives a beautiful finish and nice and brighting but I think I will stick with the trusty pro longwear! I agree! If my eyes weren’t so tired looking and puffy I’d love this stuff. But sadly, too sheer for me! I keep seeing it called full coverage but no way for me! One of my biggest pet peeves about youtube – you see these gurus talk about their terrible dark circles and god they do not know what terrible means. I constantly look like ive been punched! Just because it covers their measly dark circles does not mean its full coverage and they need to realise that – surely you would know just by the consistency! YOU SAID IT ALL RIGHT HERE. I picked up an R22 and a Y23. I am white as snow and they’re too light for ME (this shade range is laughable if you’re even remotely deep-toned, or have a tan, for that matter.) But the fact is, NARS RCC is still a better concealer. It covers better, it blends better, and it’s just all around better. If I am going to layer anything, it’s not going to be two $54 tubes without an applicator, that are sheer as can be, and have a 6month shelf life. Forget it. And you mentioned the display–they are NOT displayed in the “corrector vs concealer” situation. At least in the sephoras near me, they’re just grouped numerically, as any other concealers are, as if they’re in increasing depth. I am taking them back, because there’s no point. I might go through several Nakeds and RCCs a year, but I go through them because they WORK. I ALWAYS love your concealer reviews they are so detailed. I can tell you KNOW your concealer. I’m a bit of a concealer junkie. It’s one of my favorite make up products. I don’t have the best skin but I like my skin to look like skin and a lot of times I use just a concealer, cream blush, and mascara if I’m in a rush. I would love to see a top five concealer update. Thanks again for all you do! aw thanks lizzie happy to hear that. I’ll def do one soon! thank YOU!!!!!!!!!!!!!!!!!! xoxoxox! Lol these were the worst concealers ever. The weird plastic applicator tugs under my eyes and my concealer was so. freaking. orangey. Wtf, I’m sticking with my tarte shape tape, lol. I was disappointed too 🙁 I love Shape Tape as well! This slightly reminds me of IT cosmetics bye bye undereye concealer! Would love for you to visit my site!! Sale at Ulta? Yay, I just got my Ulta credit card! Here I go shopping!!!!! !